Ecommerce programming is an invaluable way to boost traffic to your site. Being one of the best ecommerce development companies we provide excellent quality services for small and medium-sized businesses. Our eCommerce web design and development experts can help you with plugin and shopping cart development, payment gateway integration, template designing, customization and other custom e-Commerce solutions. We've assembled the best possible professionals. Applying certified expertise and utilizing the most recent technology they deliver robust eCommerce projects of varying complexity worldwide. For eCommerce websites development we use the most popular platforms such as Magento, WooCommerce and Shopify. These platforms offer a raft of flexibility, SEO compatibility and extensive control over the content and appearance of the site which makes it easier for you to manage the store and work with its data in future. Why you should start your own eCommerce project? Internet sales are becoming increasingly popular, since prices are usually lower in online stores, range of products is wider, some stores have comparison engines that offer recommendations and it's just time-saving to have an item delivered rather than go outside and buy it locally. One of the major advantages of selling with the help of ecommerce website is that your business can captivate more geographical locations, thus reach a wider consumer audience. Professional e-commerce development services increase your chances of success significantly. To make your business benefit from e-commerce all the specific nuances must be taken into account during the creation of an online store. Our dedicated team of developers and designers has a competitive advantage among the majority of e-commerce development companies, since we specialize in various areas of web development and constantly expand our knowledge. Such a wide range of expertise allows us to take on complex tasks and deliver e-commerce applications that guarantee secure and pleasant shopping experience of your future customers. 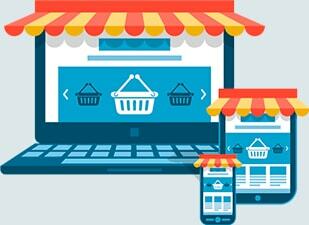 Drive conversions by means of responsive eCommerce web design services! 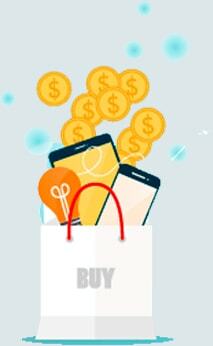 Let your customers purchase your product anywhere they want, weather they use laptops, smartphones or tablets. No more multi-screen problem! Studies show that shortly nearly every Internet user will be captured by responsive websites, be one step ahead! Nowadays one of the best ways to boost your traffic and increase sales is to create a responsive version of the online store. It is a very important step in your site development and a weighty aspect of the overall marketing strategy. Offering users dynamically adapted to different screens website you definitely attract more visitor and potential customers, but on the other hand it can hurt your business if implemented incompetently. Providing eCommerce web development services we stand for this kind of coding. Our time-proven techniques, qualified specialists and a clear awareness of the working principles allow us to build user-friendly responsive ecommerce apps that will benefit your venture without hurting the content and at the fair price. Web design and web development are very closely associated and in fact one can't function as a proper web based site on its own without another. Working with our company, besides clean W3C valid coding, you have an opportunity to receive professional assistance from our team of eCommerce website designers. Offering top-notch e-commerce web design services we take into account specific needs of your audience and special aspects of the industry to create user-friendly interface and smart UI elements tailored just to your requirements. Proven expertise and proper implementation of this work ensures perfect shopping experience on your eCommerce site. Today advanced customized e-commerce website is a base of a successful online business. Like no other development agency SocialEngineMarket realizes the importance of such an undertaking. We are always ready to do our utmost to create an exclusive e-commerce application for you or enhance profitability of the existing online store professionally and on schedule.